Growing up, tempura batter always seemed like something almost mystical. Whenever a chef on Ready Steady Cook (British cooking television programme) had no idea what to do he or she would whip up a tempura batter. In reality, tempura is a quick and easy way to prepare any number of ingredients, keeping them fresh and relatively healthy. Tempura Cauliflower? A vegetarian classic. Batter has, over the years, developed a less-than-sterling reputation for being heavy and unhealthy. The culprit? Probably poor-quality fish and chips, or the notorious battered Mars Bar (we’re looking at you, Scotland). Either way, it is a misplaced assumption that batter must be calorie heavy and unappetizingly unhealthy. My recipe for tempura batter, using both soda water and bicarbonate of soda, creates a light, airy batter, which crisps up very nicely when fried at the right temperature. And this is something to pay close attention to; when dropped in your cauliflower wants to fizz almost violently, but not brown too quickly. 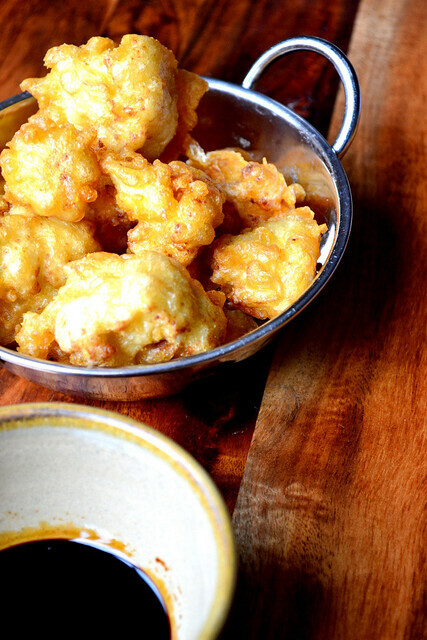 Tempura cauliflower – indeed, tempura anything – is best eaten as quickly as possible. Leave it sitting too long and the inevitable steam from the contents of the tempura will soften the batter. Achieved soft batter? You’ve defeated the point. 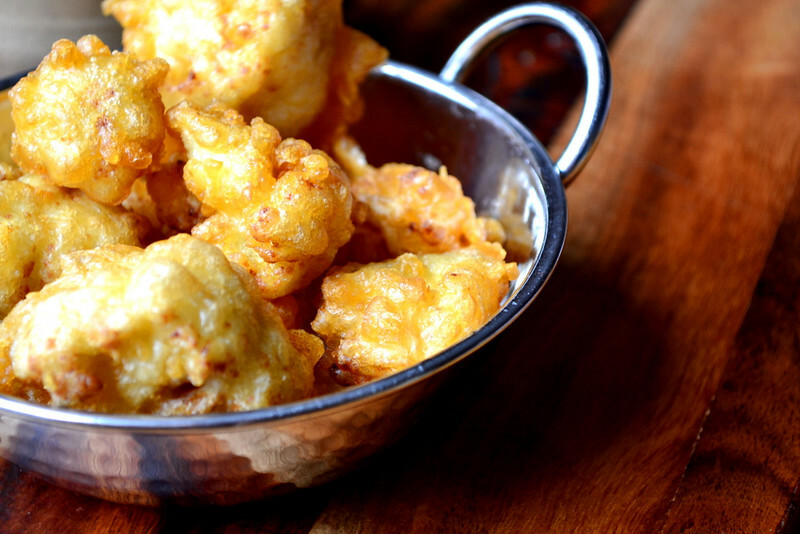 If tempura cauliflower is delicious alone, then it transcends mouthwatering served alongside a dip or two. There’s no need to get too complicated, however; a simple sweet chilli sauce or soy sauce will do the trick. There are so many things you can do with batter, and so many different types of batter to experiment with. For something a little spicier, try adding your cauliflower to an onion bhaji or spinach pakora batter. Split the cauliflower in manageable florets, transfer to a saucepan and cover with boiling water and pop the lid on. Leave to stand for 5 minutes before draining. In a large mixing bowl, combine the flour, cornflour, bicarbonate of soda and salt. Using a whisk, incorporate enough soda water into the flours to yield a smooth batter, just thick enough to coat your finger. A bit like melted ice cream. Heat the oil in a deep saucepan or wok (190C if you’re unsure). Coat the florets in the batter one by one, dropping them carefully into the oil until golden brown and crispy. Don’t be tempted to do more than a few at once. When the first batch of tempura florets are done pop them in a bowl lined with kitchen towels to drain. Serve immediately. Cost: Dinner doesn’t get much more frugal than this. A head of cauliflower and a smattering of some of the least expensive items in your local supermarket can only mean one thing; a filling and healthy meal (or snack) for no more than £1.50. * The entire price of the oil isn’t included as it can easily be left to cool and re-used numerous times. Pleasure – I hope you enjoy. Ah, Ready Steady Cook, there is a blast from the past! He has had a series on one of the food channels, or it may have been the travel channel – I can’t remember which. I only caught the trailers for it. He doesn’t look much older! Bald and with good skin! Love that guy. I had originally decided to do a Spanish-style tempura with paprika etc. still want to give it a go soon. Wow – that’s very cheap indeed! Gorgeous! I’m wondering what you’re dipping it in? Is it just soy or a concoction? It was just a dark soy – really delicious. 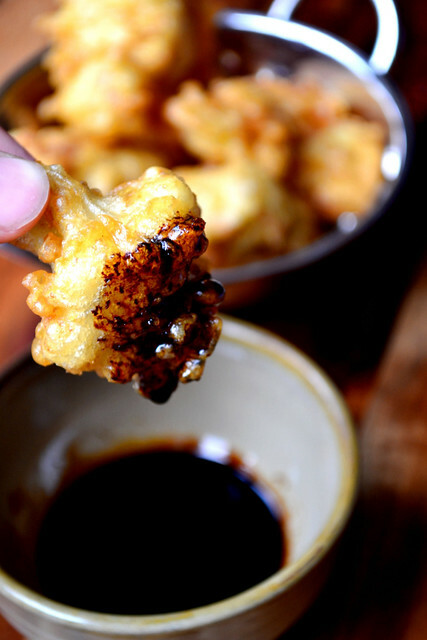 These tempura cauliflower looks so delicious! I can munch on a whole head of cauliflowers by myself! Thank you – that’s exactly what we did! These look gorgeous gorgeous gorgeous. I’m such a nervous frier though, very unsure of myself in that department for some reason! Must get braver. Thank you, Cate – back yourself. It’s easy. Looks wonderful! I am growing cauliflower for the first time in my garden….CANNOT wait to try this (assuming garden success). 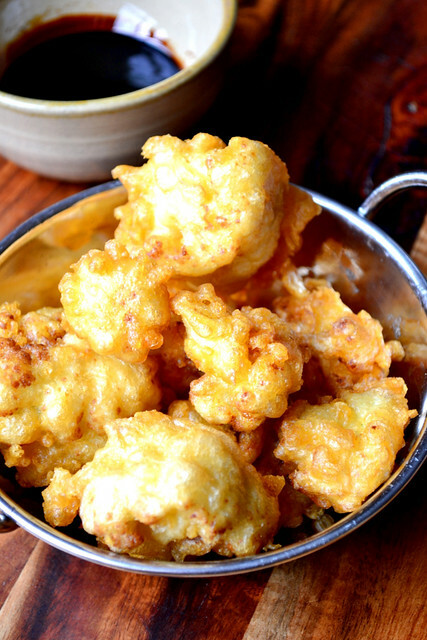 Homegrown tempura cauliflower – fantastic! Terzo Piano, the restaurant at the Art Institute of Chicago’s modern wing, is serving an amazing cauliflower tempura on a plate with some quinoa, a smear of hummus and one other thing I can’t remember at the moment. It was so good, we all left with dreams of cauliflower tempura in our heads 🙂 Your recipe is the first one I found while googling to see how to make our own. Love it, it looks delicious and so easy, thank you for sharing it! !